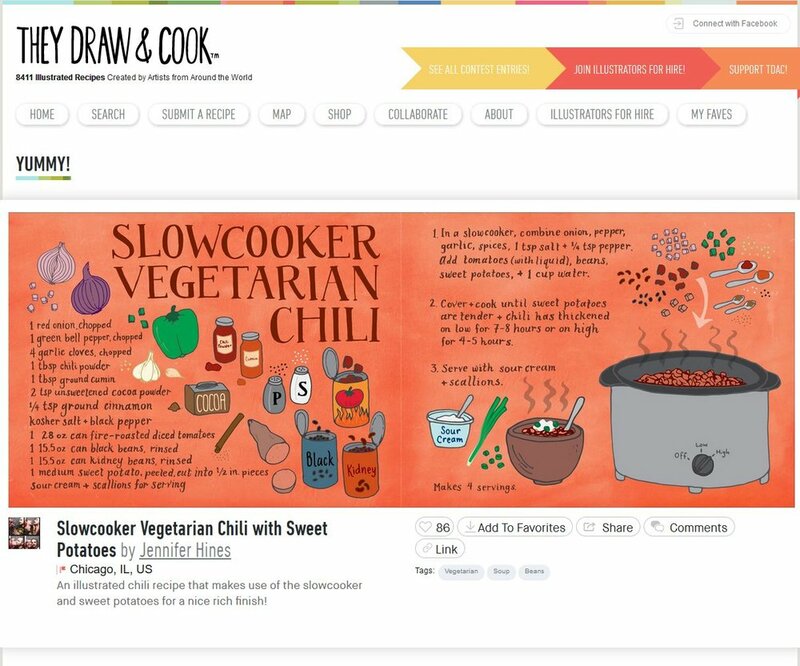 The Brief: To create a chili recipe in the size and format for the They Draw & Cook website and publications. They Draw & Cook came up with a lovely chili challenge to illustrate a favorite recipe for chili. I love this slowcooker recipe because the cocoa and sweet potatoes adds a nice complexity rather than just beans and peppers—plus it’s vegetarian. I hand-lettered all of the ingredients and instructions, then drew out ink renditions of the ingredients to add to the recipe. All the hand-drawn elements were scanned into the computer, vectorized and colorized in Adobe Illustrator, and then composed to make the final composition. A nice water color background was added to feel more festive and chili-like. All around a yummy project! Detail of left side of the final recipe. Detail of right side of the final recipe.